Aaron Hull, a dear friend of mine, sent me the following email over a month ago. It was beautiful and profound and exactly what I needed to hear. It's what I needed at the time, and it's what I need to remind myself today, and everyday, so that I am not swallowed up in my sorrow. "I was studying about Peter walking on the water to Christ today and thought of you and Vic and thought I'd share what I found. You know the story, Peter tries to walk on the water to Christ, does it, looks up and realizes he is doing it, and sinks. Most people focus on the fact that if he would have just concentrated, he would have been able to keep doing it, and that sometimes the world distracts us. I agree, but I think there is more. I think, the big lesson is not that he sank, but that Christ helped him back up. 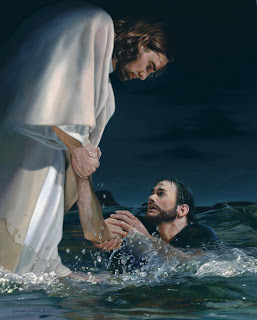 And almost as important, he made it back to the boat with Christ's help. If you look closely (this is all in Matt. 14), the storm continued all the way until they got in the boat (v. 32). Now, I, as you know, have sunk many times. I have been there to have Him say "O thou of little faith." But, to me, that is not important to Him. What is important, is the time together as they walked back to the boat, and the lesson that Peter was able to learn. So, Peter Pan...cool eh? You are Peter! There is a tragedy that has happened. The great thing about what you and Vic are doing is not significant in the fall, but in the fact that Christ loves to walk on the water with you back to the boat...is it hard? ABSOLUTELY! Does He know that? OF COURSE! I am proud of the way that you walk on the water Molly Bice Jackson. I am proud of the way that Lucy, through you, is able to be lifting others up to the surface to get them back in the boat. Also, we must realize that the storm will only stop when we make it to the boat...and that may be a long walk, but He is there with you!" I have been floundering. Drowning in my sorrows. Not doing a good job at keeping my head above water. My grief and depression are overwhelming at times. Absolutely overwhelming. I've never had the breath knocked out of me from crying so hard. I have never felt more alone. But Aaron is right, Christ is with me on my journey back to the boat. He is with all of us. He is there in the form of friends, books, spiritual manifestations, and He is literally THERE. We are doing more things than sitting around and crying, but no matter what we are doing, we are thinking about Lucy and grieving. I don't want my blog posts to be downers, I don't want to be focused solely inward and forget that life is inately good. There is still so much to be grateful for and reasons to rejoice, people to help. I know this is my season to grieve, but I know that I am more than self pity. My friends and family remind me of this. I am strong. I am Lucy's mom. I am a fighter. I have sunk to the depths and feel like there is no bottom as I continue sinking. My faith has faltered many times. But like Peter, I will be rescued and make my way back to the boat. I will. I will. Thank you for this post. And thanks to Aaron for the reminder on the lesson. It is nice to know there is someone who will help us when we sink. yes, you will. you will! i'm so proud of you molly. you inspire me. thank you. I needed this today. Thank you so much. Hang in there. And thanks for reminding me what is important once again. I believe in you. So, so much. Ahhhhh! I can't imagine how people that actually know you (not just a blog stalking pal) feel, I feel the pain in your words and I wish there was something.. someone, anyone could do to somehow relieve you and Vic of this. I cannot imagine how you are feeling, I see this small glimpse of your life and you are so beautiful, talented and spiritual it is so hard to hear of your difficult struggle. I'm sure many others have the had the same thing..but Lucy's beautiful angelic face pops in my head many times during the days since finding your blog, Most peticular the baby powder video, it so reminds me of something my little girl would do. This picture of you and Lucy is beautiful. You both look so happy and who could pull off a hot, butch Peter Pan? Only you I guess. You are so inspiring, I feel truly blessed to be able to share a small part of your life (and Lucy's) through this crazy blogging world. I am so grateful you have the gospel to cling to when the days are so very dark. I have hope...you have put so many things into perspective for me. I am learning little by little, hoping that I'm doing everything right, being a good mom, wife, trying to help this particular group of MiaMaids understand who they really are. I can't do that unless I know who I am right? Hoping I don't fail. I think Lucy knows, she knows you won’t fail, she knows how sad you are and how much so many of us (many strangers) wish we could easy your pain. And although I hope for so many things, I have this burning feeling inside that I KNOW. I Know there is something wonderful when this is all said and done. You will make it, I KNOW. When I went to the Temple last week, I was getting my things together thinking about my Yoga class that I needed to make in time, and then I saw the prayer roll. As I wrote down some names of family members I stopped and your name popped in my head...a complete stranger, but a person who has written herself upon my heart. This is what you and Lucy have done, I really liked this quote..."The only thing that a man may do that is new, is to write himself upon human hearts." So many hearts feel, and love you and your sweet angel. Wow, what a phenomenal and inspiring lesson, thank you so much for sharing, I too needed to hear this today. I am going out on a limb here to "speak for" all of us blog lurkers out here who check up on you, but never comment. You are amazing. We are all thinking of you, praying for you, and hoping for you. There is a lot of prayer power from all of us out here in the blog world- I hope you feel the very real love for you coming from the virtual world. you are so lovely, molly. You and Lucy are an inspiration to me in my life. I thank you for the reminder of what REALLY matters in life. I will continue to walk and struggle back to the boat as we all must! Thank you for allowing me to read your blog and learn and be touched by Lucy. It is so wrenching to think that there isn't a bottom to the depths of despair. It does seem that way, doesn't it? It does even for me when I really ponder heavily about your loss and that of others too. It's so hard to turn around and stop sinking. But, you are SO much more than self pity. I know that you feel like you are only wallowing in it without doing much else, but you are helping so many people. Hundreds, maybe even thousands of people are able to better deal with their lives because they read what you write and they make the lives of those around them better too. The ripple effect from your words is even better than walking on water. The ripples will come back to you too. I totally believe that what you send out into the world comes back and you will be blessed for what you are doing. You will make it back to the boat and Lucy will be sitting in it ready to pull you in. What an incredible story. Thank you for sharing your lifes story. Your blog will forever touch many lifes. I don't even know you and know you are strong. You will make it to the boat-you are making it just by surviving after a great tragedy and one day the boat will seem closer than it did the day and weeks before. I came across our blog and I like many others will forever be a changed mom because of it. I truly am so sorry for your loss. I watched all the little videos of Lucy and....WOW, pass the kleenex!! She is such an adorable little girl, to me she looks just like an angel with all of that blonde hair. I could tell that you are a great mom!! Thank you for telling your story....I will squeeze my little ones a little tighter because of your beautiful Lucy! Every time we sing, "We Thank Thee Oh God for a Prophet" in primary I focus on the second verse. And we know that deliv’rance is nigh." I have felt the dark clouds and the storm and the drowning in sorrows but I know that deliverance is nigh. I know that you will make it to the boat. Seeing the picture of your gorgeous Lucy in her pink makes me want to chant, "I do believe in fairies, I do. I do." And I believe in you and your strength to make it. It was good to talk to you yesterday. You looked really good! Even though I know that inside you're still having indescribable pain, you looked very peaceful. I know you'll get through this. You'll go on to do even more amazing things than Peter Pan. You are so talented! And Lucy will be with you to cheer you on, whether it be performances or starting your own business. Thanks for your friendship and thanks for always sharing your thoughts and feelings. You have taught me so much. I hope I am not out of place by posting. I am Anna Evensens sister, Liz. I must say how sorry I am about beautiful Lucy. Anna was absolutely right...you have handled such a painfully hard thing with such beauty and grace. I think about you each and every day...and am keeping you in my prayers. Anna speaks the world of you - I hope to meet you some day! You don't know me but i found your blog through anothers, you know how it goes. I have spent the last hour crying and laughing due to your blog. I just want you to know that you have strengthened my testimony and brought a new light on how i need to take in the little moments with my children. you and your husband are such an inspiration, such an example. Thank you for have a public blog, you have changed not just mine i am sure but alot of lives . thank you. I have just come upon your blog somehow, and I have been so inspired by it. I am also a friend of Aaron Hull. I have a daughter who is 5 months old, and I cannot even imagine the pain that you are feeling. I have been inspired to be a better mother, wife and person by the beautiful words that you have written. I have read your blog with tear-filled eyes and wished that there is something I could do. I guess all I can offer are my prayers for you. I am so glad to know that you have the gospel in your life. Your life story has truly helped my testimony to grow. Thank you for sharing it with me. You are in my prayers. What a great lesson!!! no I didn't get the text. thanks so much for caring and thanks for sharing and letting us a part of you life. Just another lurker who you have touched more than you know. Your words have made me want to be a better person. Thank you, thank you, thank you! Sorry I'm a blog stalker too. I'm from Spanish Fork and I saw little Lucia's obituary in my paper. We wondered what the link was to Spanish Fork. Katy my daughter found out that little Lucy was a friend from High Schools little niece(Paul). I have a little granddaughter named Lucia and your Lucy looks a bit like my grandaughter Ellie. Sorry for the rambling history but I have been reading your blog since I found out about it. Your pain is so raw but your faith is so strong. You write so lyrically (is that a word?) and I just love to read about how you are coping and gaining strength. My thoughts and prayers are with you and I know that you will weather through this pain and become so much stronger. You have your own little angle watching over you. My heart aches for you and the suffering that you and Vic are going through. My thoughts and prayers are forever with you. 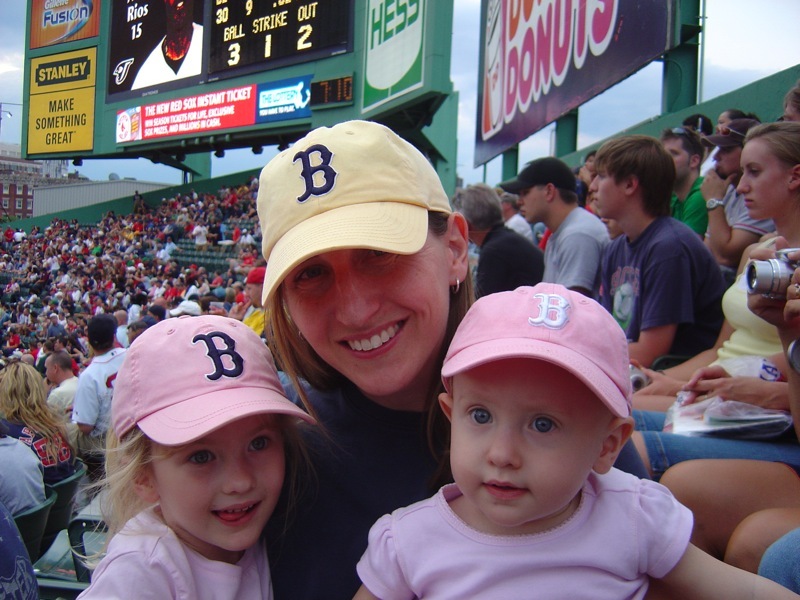 I didn't know that it was possible to put a mothers love into writing until I read your blog! Your blog has forever changed me...Lucy has changed me! I now look at my sweet nursery kids in a whole new light. Instead of feeling like I am stuck in the nursery I feel that it is a honor to work with these little children so fresh from heaven! Here is a good scripture: Alma 36:20 "And oh, what joy, and marvelous light I did behold; yea my soul was filled with joy as exceeding as my pain." Molly, you are in for some intense joy! I hope that it comes to you sooner then later! I know that you will make it back to the boat...we are all praying and cheering you on! Molly, I love what you said about life being inately good. I couldn't agree more. Life throws curve balls at us sometimes that make the word "trial" seem like a day at the circus. But that comment really caught my eye. After my cousin, Mandy, was killed (you should have heard this story since she was a fellow Rexburgler), I listened to a song over and over, reminding myself that even though someone could do something to tragic and brutal, life is good and the soul of the universe is good and wants the best for us. Give 'er a listen. The Heart of Life by John Mayer. What beautiful inights. I loved what your friend said about Peter, and what he realized. It's so true. It was so great to see you two the other night, we loved it. You are so strong, both of you. So much stronger than you think. You really are amazing. I don't know you. But I wish I could help with some of your pain. I can't even imagine what you and your husband are going through. Thank you for sharing your testimony. I am always in tears when I read your blog, but can always feel the spirit so strongly through your words. I would love to put a link of your blog on mine so my friends and family can feel what I have felt through your inspiring words. If you don't want me to I totally understand. 2nd baby girl last year due to a rare genetic disease. They have now fallen away from the church. The deaths of their little girls was unimaginably tragic, but the end result even more so. It is amamzing to see your strenth. You have been in our prayers. I still pray for you every day. You will make it, Molly. Thank you for sharing your grief and life lessons with us. As I have read your last two posts, the words and music of the hymn Be Still My Soul has been constantly going through my mind. If I could give you something to comfort you right this moment, it would be this song. I admire you greatly and am so thankful that you are teaching me about life and about the Plan of Salvation through your blogs. Your faith AND Grace amaze me. in every change ye faithful will remain. You don't know me, but my friend just passed along the link to your blog because I just lost my sister a few weeks ago. She was a young mother, only 30 years old, with four children. It has been the hardest thing I have ever had to deal with. She was not only one of my very best friends, but most of my grief comes from just watching her husband and young children trying to go on without her. Your story was heartbreaking. I can't even imagine losing a child, it pales in comparison to my loss, yet I am so impressed with your faith in this trial. You are an inspiration to people everywhere. I am going to pass your link onto my 9 other siblings because your words brought comfort to me. I am so grateful for the gospel and have such a strong testimony that God lives, and that He has a plan for each and every one of us and that He knows all. I only hope and pray that His loving arms are wrapped around you and your husband and that you will find the peace that he so freely gives. Thank you for your example. Thank you for letting me put your link on my blog. I am the one who is honored. You are so beautiful. Always thinking of you and your family. Hope today was a good day. Thank you so much for the kind comment that you left on my blog. I was actually very surprised to hear from you; I'm sure that you don't know that I've been following your blog since a day or two after your precious Lucy's accident. My son Jeff told me what had happened. He is a close friend to your friends Danny and Darcie. So I found the link through their blog. Your posts have deeply touched my heart and you have been in my thoughts and prayers. I know you will make it through this and you will feel lasting happiness again. May the Lord continue to bless you. OK, I guess I am a bit of a blog stalker. I am Janeese Summers' Sister-in-law and her blog led me to yours. 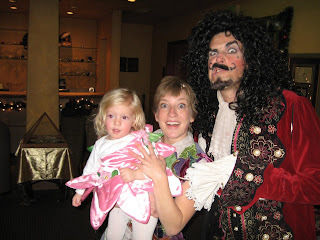 After I read your inspiring interpretation of Peter's adventures on the sea, I knew why I happened upon your blog. It appears we may have some common ground!!! Keep fighting! Thanks for your courage!